My husband and I have been married now for decades. But since the beginning, I would hear stories about his time visiting his Grandma Sissy, on the banks of the May River, near Bluffton, South Carolina, and her legendary crab boil. The story goes like this… when my hubby was 12 years old he would take a row boat out with shark bait he caught to catch crabs. Then he would set out crab traps and be out all day doing this until he had a good haul. When he got back to his family’s dock, his grandma Sissy and his aunts took the crab he caught and used it for a big family seafood boil. Grandma Sissy has been gone now for over a decade, so I can only imagine what she did to prepare one of the best meals my hubby has ever had. After hearing his longing to experience a seafood boil again, I went looking for a recipe that might live up to his standards. 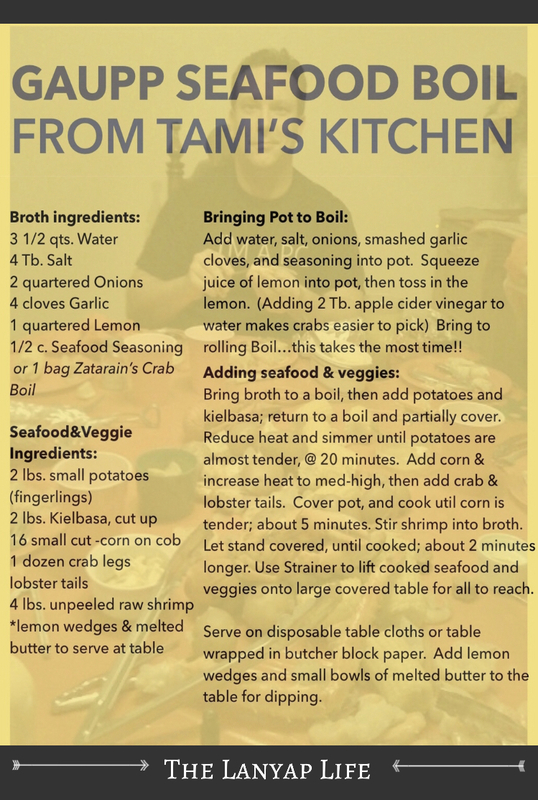 I ended up combining two recipes, the one on the back of the Cajun Seafood Boil Seasoning box and a recipe called Frogmore Stew that I saw in a magazine. The first time I tried it was for our Christmas Day meal. And since I love baking, I also baked up a double batch of french bread. I will never forget the look on my two sons’ faces and their shock when they saw me dump all the food down the center of our plastic lined table. It was so much fun! We ate mostly with our fingers and had a competition going to see who had eaten the most by who had the biggest pile of crab, lobster and shrimp shells. Clean-up was a breeze since it was a one-pot meal. Also, to clean up the table we simply lifted the plastic table cloth off, wrapped it up and threw it in the trash. This recipe is MORE than a meal, it is an event to invite family and friends to. It creates a fun and easy atmosphere to enjoy each-others company while sharing a meal. I hope this recipe brings you as much fun as it has my family! Feel free to adjust the ingredients you want to add to this boil. It took me a while to perfect the amount of seafood and veggies that would fit into the pot without boiling over. Here is what I have settled on after several years of experimenting. I found a few of my favorites are to use frozen, small cut corn on the cob, the small fingerling potatoes that don’t need to be cut, and unpeeled raw shrimp. Using unpeeled shrimp comes out moist and tender, where as the peeled shrimp always ends up overcooked. Peeling the shrimp is done when you eat it at the table, the same time cracking open the crab legs and lobster tail. I had to get used to peeling shrimp at the table but it is totally worth it! Add water, salt, onions, smashed garlic cloves, and seasoning into pot. Squeeze juice of the lemon into pot, then toss in the lemon. (Adding 2 Tb. apple cider vinegar to water makes the crab easier to pick) Bring the water to rolling Boil… this takes the most time!! Bring broth to a boil, then add potatoes and kielbasa; return to a boil and partially cover. Reduce heat and simmer until potatoes are almost tender, @ 20 minutes. Add corn & increase heat to med-high, then add crab & lobster tails. Cover pot, and cook util corn is tender; about 5 minutes. Stir shrimp into broth. Let stand covered, until cooked; about 2 minutes longer. Use Strainer to lift cooked seafood and veggies onto large covered table for all to reach. Serve on disposable table cloths or table wrapped in butcher block paper. Add lemon wedges and small bowls of melted butter to the table for dipping. 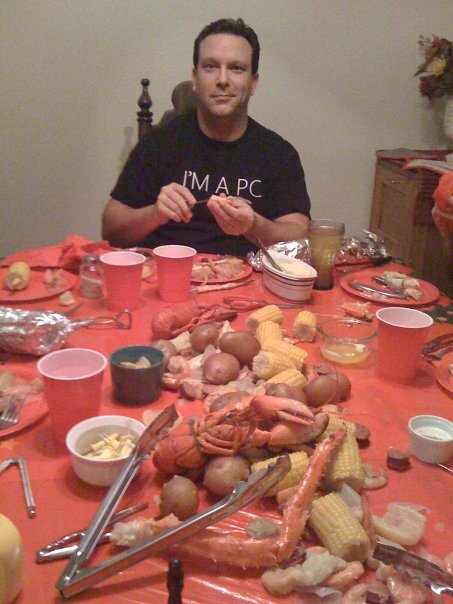 My version of my hubby’s childhood crab boil memory has been a smashing success!